The traffic violation detection is being performed automatically by Video Content Analysis applications. Human resources are only needed to confirm violations in an extremely simple dedicated software. Logipix engineers developed these VCA applications that can accurately detect all the typical traffic violations and provide detailed information of the traffic flow. They are being run by the Network Video Recorder which works on-site with real time images. With this structure, the system can be immensely bandwidth-effective. After local image processing, only a small amount of data should be transmitted to the servers and to the clients. 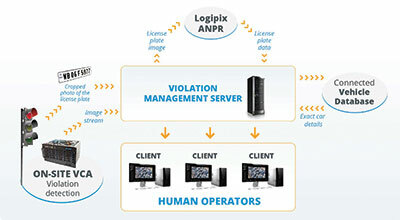 The Logipix Traffic Surveillance System does not simply detect and record the violations but manages them. It creates a detailed violation package and as an end result an issuable violation report. To do so the system automatically collects the textual information of the license plate, vehicle data and owner details. 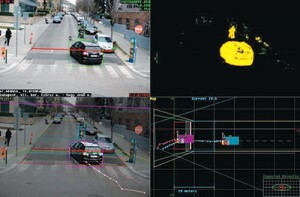 These are provided by the integrated license plate recognition software and the connected vehicle database. Logipix goes beyond simple traffic surveillance. Besides its intelligent and advanced automated violation detection methods, it is able to fulfill city surveillance tasks as well. Together with the 20 MP IP camera, a Full HD PTZ camera is installed too in the intersections that continuously scan the surrounding environment. Both types of cameras ensure real time monitoring of the urban area in the control rooms. The versatile video management software, the Control Center is able to seamlessly visualize unlimited number of camera streams at once. If a vehicle breaks the traffic rule, the system automatically detects it on-site with high precision, creates a violation package which will be recorded in the local and the centralized databases also, furthermore the violation management server downloads several images of the offending vehicle to a centralized image container. At the intersection, the Logipix VCA module automatically detects the number plates in the images. The module then crops the images and sends only this small amount of data to the centralized ANPR for character recognition. The integrated ANPR recognizes the characters of the license plate, transforms it and sends the license plate data in ASCII text format to the Traffic Surveillance System Server for further processing. The Logipix Traffic Surveillance System automatically requests the exact vehicle data from a vehicle database based on the recognized plate number information. Among others the query provides information of vehicle model, color and year of manufacture. As a final step of process, operators confirm these automatically created violations in the Violation Management Clients. The user-friendly design of this software ensures daily 10000 citations throughput for each workstations. The Logipix system supports Distributed Command and Control Center operations. There could be multiple control rooms in multiple locations where the police officers could overview or manage just a part of the system or the full system at all. A control room can be optimized for real-time monitoring operation or it can be optimized for violation management operation. In the Real-time Control Room, there is a video wall and a couple of workplaces to track the traffic flow and every suspicious activities of the pedestrians and to watch back archive security footage. The Logipix system automatically measures the traffic flow based on the camera images, it generates alarm and the operator could easily check the traffic conditions selecting the live images of the appropriate cameras. In the Violation Management Control Room there are tens of simple workplaces for the operators to confirm the expected huge number of processed traffic violations. In the Violation Management Control Room there are tens of simple workplaces for the operators to confirm the expected huge number of processed traffic violations. The Logipix System satisfies the highest specifications that a contemporary traffic surveillance system should provide. A well-functioning system helps improve traffic moral and therefore the throughput of roads can be increased, traffic jams can be reduced and transport time & costs can be lowered.